Tang Soo Tao is a science which uses self defence as a tool to combine the gross physical levels of our existance with the higher planes of our esoteric mind. Basic movements and forms are designed for gradual progressive development of the body's energies over many years. Working closely with others in our physical training builds respect, love and understanding of each other which leads to trust. We experience that we all have strengths and weaknesses and learn to recognise and accept these in ourselves and others. The training experience forces us to have a good look at ourselves and provides situations where our real character emerges for all to see. Many people are shocked at what they find. Some use it as an incentive to improve. Self respect comes from striving to better ourselves and true satisfaction comes from helping others. Basic techniques are learned through repetition of detailed postures which utilise natural mechanical efficiencies in the body. Specific methods are used to stimulate proprioceptive reflexes and physiological mechanisms to generate powerful movements. An understanding of distance and timing comes from working in harmony with a partner in progressively less structured formats. Initial studies cultivate Yang Chi through Hard/External Style linear motion characteristic of Okinawan Karate with the advanced kicking techniques of Soo Bahk Do. Continued study is a gradual transition through the circular motion more common in Wu Shu to the Soft/Internal Style motion of Tai Chi which cultivates Yin Chi. These aspects of our being are inseparably intertwined. 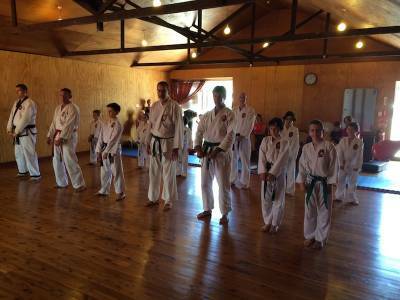 While Tang Soo Tao practice is very physical, the mental and emotional development is more subtle but inescapable. All movement begins from the centre of mass and flows outward through the articulated joints of the limbs to the extremities. Linear and rotational movement is combined with sinking our energy to produce a whip like generation and release of energy ending in balanced stillness. Concentration on the correct positions for preparation and execution of each repetition protects the body and yields the best result from the technique. The goal is for this precision to become automatic when a technique is applied. 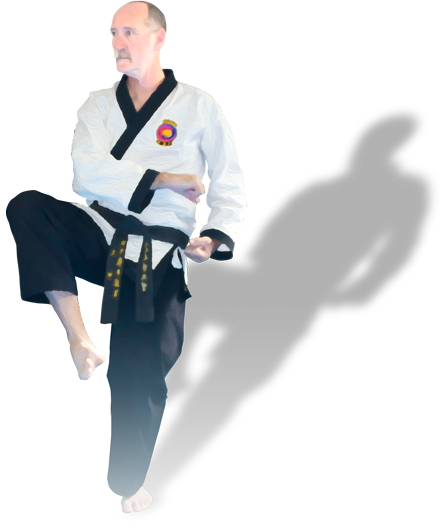 Tang Soo Tao is practiced with speed and power controlled for the circumstance to ensure the safety of participants. The level of contact used is adjusted to minimise the chance of injury. Abdominal breathing is practiced providing constant activation of core spinal support muscles. Breathing exercises from Buddhist meditation techniques and Yogas are used to settle the mind and the Chi in the body's centre. The breath is coordinated with movement to assist the generation and release of energy. As the student demonstrates understanding of a concept, another layer of information is provided to stimulate further development of skill and understanding. this process provides constant challenges to progress from basic competence to proficiency to true mastery of the art. 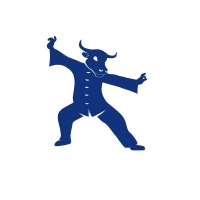 Tang Soo Do (now called Soo Bahk Do) was founded by Master Hwang Kee in Korea and was taught to American servicemen at the Osan Air Force base. Master Robert Caputo brought the art to Australia and founded Tang Soo Tao which incorporates Yang style Tai Chi from China and influences from Tibetan Buddhism at the advanced levels. Ramsdale's Tang Soo Tao opened in Brisbane in May 1999 and in Caloundra in November 2008. Kyo Sa Nim Stephen Ramsdale holds the rank of 3rd Dan Black Belt since 2004. This unique neuro-muscular training method has been developed from 4 decades of study in external and internal martial arts and the anatomy and physiology of exercise. 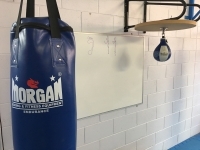 The method enables very fast, very powerful punching without any need for size or strength or fitness. Have effortless, bone breaking knockout power with both hands, every punch, every time moving forward, backward, sideways or standing still. Sounds impossible? It’s readily attainable. It’s not necessary to understand the theory, just apply the process. Thes classes are part of the Tang So Tao syllabus but can be attended by anyone with an interest in punching bag training. Training is presented in easy to learn stages using hanging bags and speedball for 4 x 10 minute sets per 1 hour session. Available 9:30am Tuesday, Thursday, Saturday at 124 Bulcock St Caloundra commencing January 7. Prior booking essential. Price is $15 per session casual or $110 per calendar month. Saturdays Grading was very satisfying, with 4 Adults and 7 Karate Kids testing to advance to the next level. Special congratulations to Darcy Quirk and Nathan Spedding who double Graded after putting in great efforts throughout the term. Also a mention of Angus McAdam who achieved his blue Belt at 68 years of age. Well done to all who participated, and thanks to everyone who came along to share the event. 11:00 am start so be there soon after 10:30 am to get changed, warm up and go over the material you are being tested on. Even if you are not grading you should come along in your uniform to support the others. bring a camera and take as many pictures as you like. 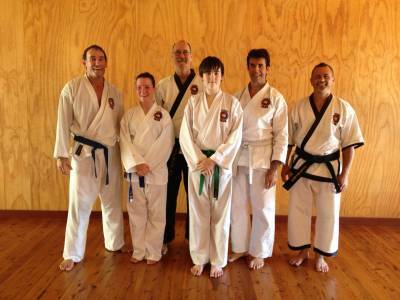 There will be a Grading Test in Caloundra commencing at 11am Saturday 14th June. Come and see Alex, Kev, Ted and Eoin demonstrate their skill and understanding of Tang Soo Tao with Forms, Technique Combinations, bag work, One Steps and sparring. Stay on for some refreshments on the deck and catch up with old friends after the testing is complete. Congratulations to Alex, Kevin, Ben and Ted on a great grading. Good performances from all candidates and spirited free-fighting sees each candidate being promoted to advanced levels of Blue Belt (Alex & Kev) Green Belt (Ben) and Purple Belt (Ted).